Meatloaf is one of my go to recipes. It's easy, prepping isn't time consuming, it's tasty, and comforting. You can dress it up (yes, I once served a fabulous meatloaf at a party!) or down - and kids usually love it, which is a big plus. I even use my simple recipe as a base for Shepherd's Pie. I love meatloaf! Because it's a family favorite, I try to find different vegetables to add and ways of seasoning it to make it an interesting and not a, 'What? Not meatloaf again!' meal. We thought this Italian version was a winner. See what you think. ¼ cup bread crumbs or crushed croutons, these can be flavored (I like Italian crumbs or Caesar style croutons). It's up to you! In a large bowl beat eggs with a scant teaspoon of water. Add bread crumbs or crushed croutons and let sit for a few minutes until the crumbs have absorbed the egg mixture. Add mushrooms, Parmesan cheese, garlic, onion, and herbs to crumbs and mix well. (I add herbs, veg, and cheese to the crumbs so as not to overwork the meat, which makes it tough). Add ground beef and mix thoroughly. 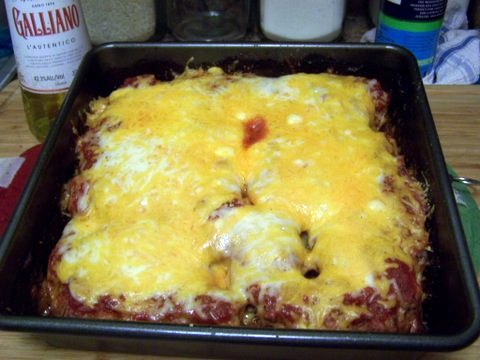 Place meat mixture in loaf or pan of choice and top with marinara sauce. Place on cookie sheet and into oven for 45 minutes to an hour. Remove from oven and sprinkle Italian cheese on top and back into oven until cheese is melted and bubbly. Remove and allow meatloaf to rest for at least 5 minutes. Serve with salad or veg and favorite side. Enjoy! How to make, Italian style Barramundi, with pine nuts, and Barramundi in a Lemonade batter. RealityTalk ... I love that combination! Meatloaf is just so versatile! I love meatloaf. I will have to try your recipe. It sounds great. I have always made my meatloaf with a mixed topping consisting of half a cup of ketchup, 2-1/2 tablespoons of brown sugar and one teaspoon of dry mustard. Hi Annie, this recipe is definitely one for me! I hope you enjoy, Phyllis ... thanks for looking! I have got to try this recipe! I, too, love meatloaf and am always looking for variations. Thanks, Annie, for sharing. Thanks you so much! I hope you enjoy it as much as my family does, peachpurple. Sign me up. Meatloaf is my favorite meat dish. This sounds delicious.